SPOILER ALERT: The below feature contains major spoilers from this week’s issue of Justice League vs. Suicide Squad. Don’t scroll any lower if you still haven’t read it! If you care even one iota about the DC Universe, then this week’s JUSTICE LEAGUE VS. SUICIDE SQUAD #4 is an absolute must-read. It’s exciting, fun, surprising and packed with twists and details that will be felt throughout the pages of Rebirth for months to come. And it’s not even the final issue of the miniseries. There are still two more issues to go! But let’s talk about issue #4. Writer Joshua Williamson and artist Fernando Pasarin don’t skimp on the action, as Maxwell Lord’s team of forgotten villains (which we learned in this week’s SUICIDE SQUAD #9 were actually the very first iteration of Amanda Waller’s Task Force X) infiltrate Belle Reve in search of revenge and whatever it is Waller has hidden away there. Fortunately for Waller and the rest of us, however, Belle Reve is protected by the combined forces of the Justice League and the current Suicide Squad. The heroes, villains and…er, even worse villains square off in a thrilling battle that involves monsters, magic, magnetism, bullets, boomerangs, brain bombs, swordfighting, shooting, super speed and just about every other form of alliterative hand-to-hand combat imaginable. But hidden between the blows and gunshots are teases and tidbits that Rebirth readers may want to take notice of, like this showdown between Superman, the two Green Lanterns and the evil Emerald Empress. Hmm… Maybe someone should tell Emerald Empress that she’s got the wrong institution. Last time we saw Saturn Girl, she was locked up in Arkham Asylum. 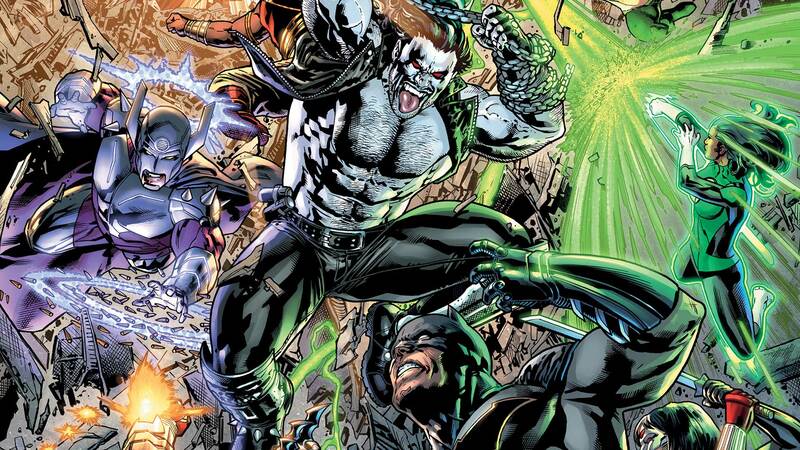 Katana spars with Rustam, Cyborg takes down Doctor Polaris, Wonder Woman and Harley Quinn team up against Johnny Sorrow, and Batman, Deadshot and Amanda Waller have one wild throwdown with Lobo. But it’s all just a distraction from Maxwell Lord’s real goal—he wants what’s buried deep within the prison. Something so secret that it even frightens Waller. But what is it? Anyone who knows what the Heart of Darkness is knows why this is a very bad thing, and anyone who doesn’t is about to find out. Why? Because as Justice League vs. Suicide Squad #4 reached its end, this happened! The Justice League has been “eclipsoed”! When Earth’s greatest heroes fall, who will protect us against them? Looks like we’ll find out when Justice League vs. Suicide Squad continues next week!